Bags packed and hiking boots on, we were all ready to set off with Gilbert, our guide, for a weekend at the Arenal volcano. Gilbert Villalobos has been working with ILISA for several years, leading tours to places of interest all over Costa Rica. 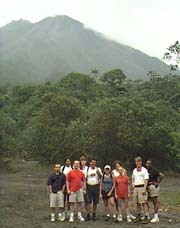 The tour he guides most frequently is to Arenal, which is a very active volcano, in the province of Alajuela. The trip is a great way to see a natural wonder of Costa Rica, an opportunity to get to know some of the other students, and, of course, a perfect outlet to practice all of your newly acquired Spanish. There’s no need to be nervous, however, as Gilbert is one of the most patient men on earth. We left ILISA at about 2:30 on a Friday afternoon, in Gilbert’s super comfortable mini-van, for the 4 hour drive north, through mountainous terrain filled with coffee plants and plantations of ornamental plants that are exported to Europe. The drive is beautiful though quite windy, so if you have a tendency to get motion sickness, I would bring along some dramamine. 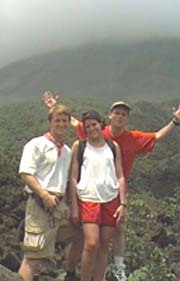 We eventually arrived in the town of La Fortuna, several kilometers from the volcano, where we would be staying. 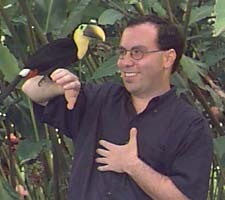 Villas La Fortuna is a really nice complex with a row of rooms, a newly opened swimming pool and some super friendly toucans who love to be photographed while sitting on your shoulder. Our first outing and accompanying Spanish lesson was at dinner, where we could choose from a variety of native dishes, including fish fresh from nearby Lake Arenal. My favorite, though it’s a beverage rather than food, is the guanabana fruit shake. It has an indescribable taste that, for me, sums up all things tropical. We then drove to a spot with a great nighttime view of the volcano. It was something quite special-the very top of the volcano was incandescent with glowing gases, red-hot rocks and the occasional sparks shooting from the crater. We had great luck with the weather, giving us a clear view of all the action but even if you aren’t so lucky, you can still hear all the action, without the visuals. After a good nights sleep, we were off to hike the volcano. It was a challenging ascent, about 2 hours long, but well worth the view at the top as well as the face to face encounter with several spider monkeys who made it clear that we were invading their turf. Along the way Gilbert explained to us the various plants and animals that we were seeing. I was really impressed with the leaf cutter ants that can carry a cargo of cut leaves, of up to three times their weight! We finally, after much huffing and puffing, reached our destination. From this point we had a great view of the volcano, including the burnt trail left by the flowing lava that erupted in May. Our next stop was the natural hot springs found at the base of the volcano. We opted for the more basic springs, rather than the pools located within the Tabacón resort, though I have visited the resort before and it is well worth the entrance fee and the option to treat yourself to a facial, mud mask or a massage. We lounged around for several hours, resting our weary bodies and soaking up all the minerals in the water as it flowed downstream. 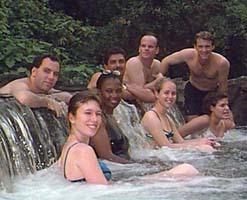 There are several small waterfalls that you can sit under for the massage effect. It’s wonderful. We were also treated to a visit by some howler monkeys who were snacking in a nearby mango tree. That night, though the local disco was an option, we all chose to hit the sack early. It had been a really full day and I know that I fell asleep as soon as my head touched the pillow. The next day our group split up into two, several people chose to go white-water rafting on the Sarapiquí river. 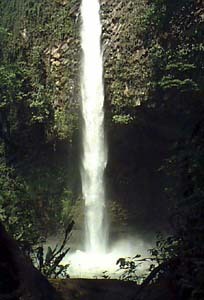 The other half of us elected to visit the nearby Fortuna waterfall. On our way down the steep, stone steps, Gilbert explained that until recently, there were no steps at all and people descended with the help of a rope, especially in the rainy season when it’s pretty muddy. The hike was shorter than the day before and we were rewarded at the end with a breathtaking view of the 25 meter high falls. Those of us who were brave enough, plunged into the pool formed at the bottom of the falls. Well, to be honest, we inched our way into the pool, grimacing with each step because of the cool temperatures. Refreshed from our swim, we headed to lunch and then piled back into the van for our ride back to San Jose. Gilbert does the tour nearly every weekend in the high season, June, July and August and usually twice a month the rest of the year. The people of La Fortuna have said that he brings the good weather with him almost every time. If you have the opportunity to go, I would highly recommend it.